Animation starring as the vioces: Ben Stiller, chris Rock, David Scwimmer, Jada Pinkett Smith, Sacha Baron Cohen…This is definitely a film that parents won’t mind paying the full adult price at the cinema to watch a kid’s film. It is really funny the whole way through, and plenty of touches of humour and film references that the children won’t even notice! (Actually several had to be pointed out to me. Look out for American Beauty and Silence of the Lambs to name a couple). I recommend this film and is easily one of the best in its field (in terms of plot and humour, but not so good for the actual graphics side of things) and will appeal to very young children who simply like to watch animals dancing about and talking, and, like I said adults will enjoy this too, so if you’ve teenagers and younger kids too and are on a family trip to the cinema, this film is a very good choice. A group of animals escape from a New York Zoo and end up ship wrecked in ‘The Wild’! They soon have to adjust to what life is really like for wild animals and realise they had it easy in the zoo. Did they manage to get rescued and go back? Well, I have to say I would have preferred the other ending to the one they chose, but never mind! My kids were happy with it! Anti-reflective coating on your glasses – is it worth it? Whenever I’m recording a You Tube video in my work-room, all I seem to do is spin round in circles trying not to have massive white rectangles on my glasses. They somehow even manage to appear with my back to the window! 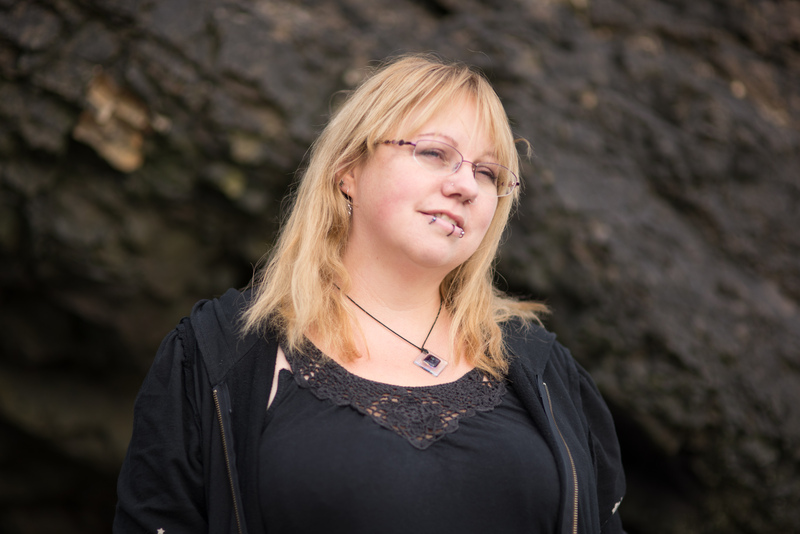 When Chris is taking photos for my Weekly Wardrobe posts, we’ve more-or-less given up with glasses, so I stumble about blind for the sake of not having glaring white blobs in the middle of my face. (Hashtag blogger problems.) I am so short-sighted, I cannot see a thing without them, and I hate that feeling so much. So finally, even though there was nothing particularly wrong with my glasses, I decided to splash out and buy a new pair with anti-reflective coating…. It was my birthday! And what better way to celebrate than going out and have someone else cook for you. And clear away. Yeeees! I absolutely love eating out. It’s just such a pity that one meal out for the four of us costs about the same as our weekly shop from Tescos. But you see, (as I sometimes remember to remind myself) if you did it every day, it wouldn’t be special, would it? My lovely daughter, Rain did the research, and hunted out all restaurants within a reasonable distance that served Duck, being that duck is my favourite meal. 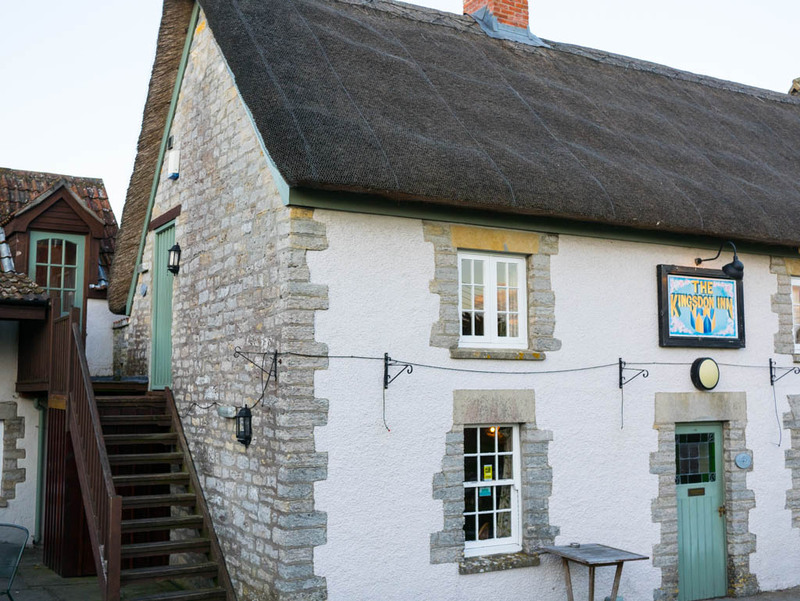 The Kingsdon Inn came up as one of the top twenty restaurants in Somerset, and when my husband phoned to check food serving hours, it turned out you need to book well in advance if you want a table. We were lucky and got the second-to-last one; which is not what you’d expect for somewhere truly out in the sticks…. I have a thing for old bottles. Whenever I see one in a flea market or boot sale, I always pick it up; wonder what it once held and who in its history has owned it; but end up putting it down again because I’ve never had a reason to buy it (aren’t I good?!). However, I’ve finally thought of a reason to buy a whole load of them! And because I was impatient, I bought a job lot of vintage clear glass bottles, but actually it would’ve been fun to build up the collection over time, picking one up here and there. 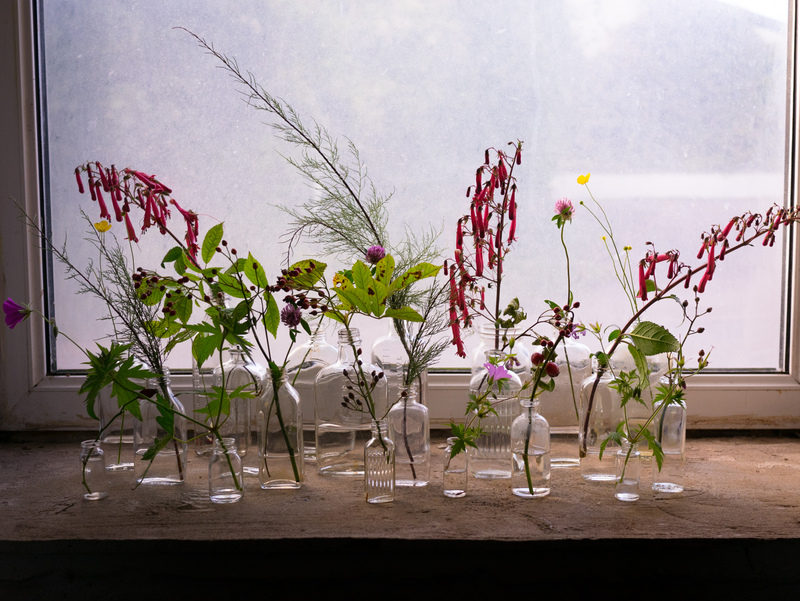 I thought this would be a nice quick and easy blog post just sharing my flower arrangement idea, but I ended up being pulled into the time-draining vortex of the internet discovering all sorts of things about old bottles! Did you know there are collectors’ clubs and events all over the country? If I had time for another hobby, I can see that vintage bottle collecting could become one of them!….. Negotiating lipstick with piercings and a wonky mouth! I have never really worn lipstick. In my mind, it just hasn’t suited me – I have a very thin top lip and and a very fat bottom lip and overall my mouth is very lop-sided. I could happily go on being self-critical, but I won’t! 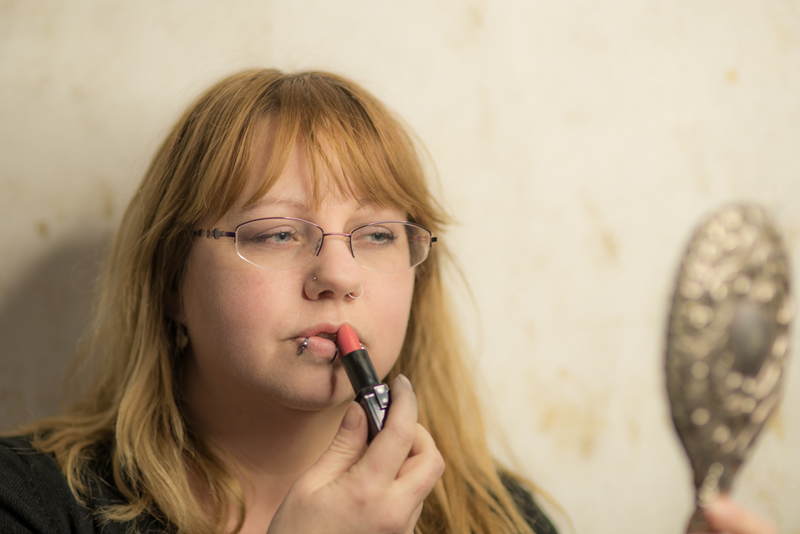 I also think part of the problem is I was trying the wrong colours – brown was very much the fashion in the ’90s when I was playing around with make-up, and although I never really thought lipstick fashions were a thing, I have noticed that brown lipsticks are back….